Sunday March 25th 2018. 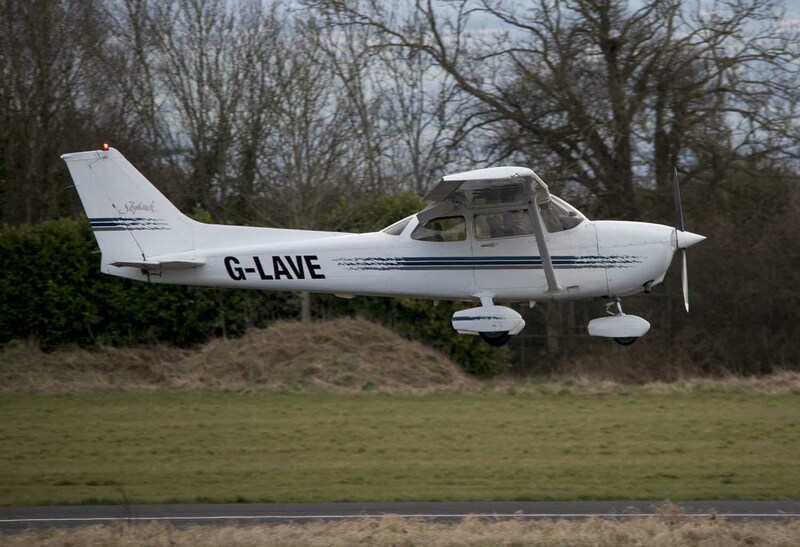 Great excitement at Weston Aerodrome as a group of 20 plus Trim Flying Club Members and some family assembled in the Restaurant and anxiously awaited the arrival of our latest fleet acquisition- G-LAVE from the UK. 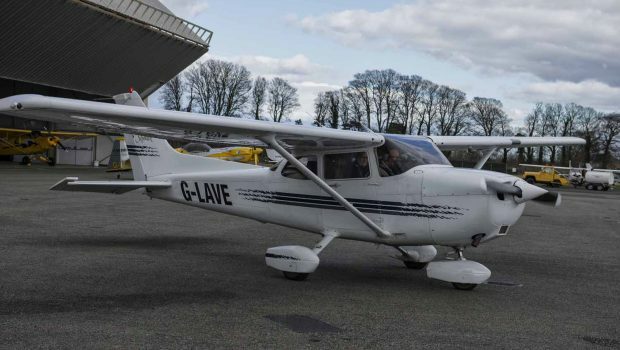 She’s a 1999 Cessna 172(R) which, after much searching by our dedicated team (Phil McManus, Michael Durkan, and Owen O’Neill) had been located at Top Farm Airfield in Cambridgeshire. Having “ticked all the boxes” for us in terms of year of manufacture, engine hours, general condition, maintenance records and price, an evaluation team had been dispatched some days earlier to carry out an up-close inspection. Every panel that could be lifted was, every pipe, conduit and wire examined in detail, maintenance records pored over. 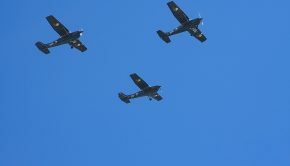 Finally, a test flight “round the houses” conducted by D/CFI Donal Foley made the team happy out. Green lights and thumbs up all round, the purchase was unanimously recommended. Full Committee approval was achieved Inside of 2 hours. We had “found the one we were looking for” (unlike U2)- it was game on and we were doing the business! Financing (mostly from our own resources) was already in place, so a small deposit secured our interest. 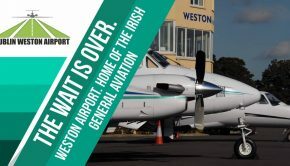 Arrangements were made to complete the transaction and ferry her home to Weston on the afternoon of Saturday March 24th. Ferry crew of Michele Dore and Phil McManus were off bright and early with Ryanair to Stansted where the vendor was waiting to whisk them down the M11 and Top Farm. Excitement levels at Weston went off the scale but were soon dashed by the RVR at Top Farm. No improvement was expected so an unscheduled overnight was required. Sunday March 25th dawned with much improved conditions in prospect. 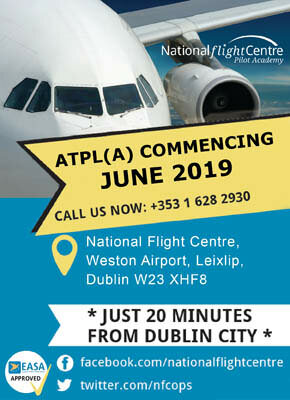 Flight Plan filed with an ETD of 13.30. Once again the excitement and anticipation at home grew. Confirmation of departure was received from Phil and the word went out that a welcoming party/ guard of Honour would be appropriate. 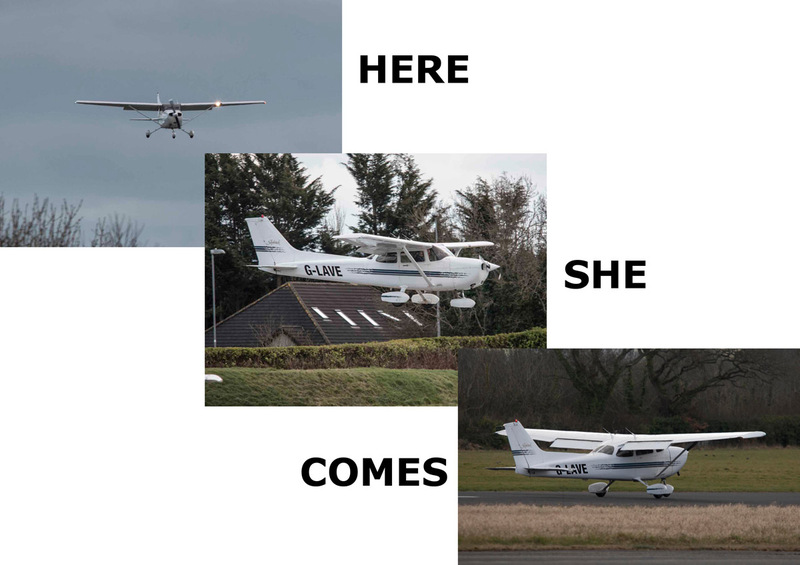 Declan Foley picked up and shared a position fix showing her approaching the Welsh Coast. Those of us gathered in the restaurant had confirmation from Antonio in the Tower that she was pretty much established on descent for a slightly earlier landing than we had expected. Following a mad scramble for HI-VIS jackets we headed out to the East Apron to form up. The aircraft almost beat us to it! Photographer Paul Kolbe was out at the threshold of 25 where he caught first sight and followed through on Micheles’ perfect touchdown. (See Top pictures) Noel Connolly was also active on the video front to capture her taxi in to rousing cheers and applause. 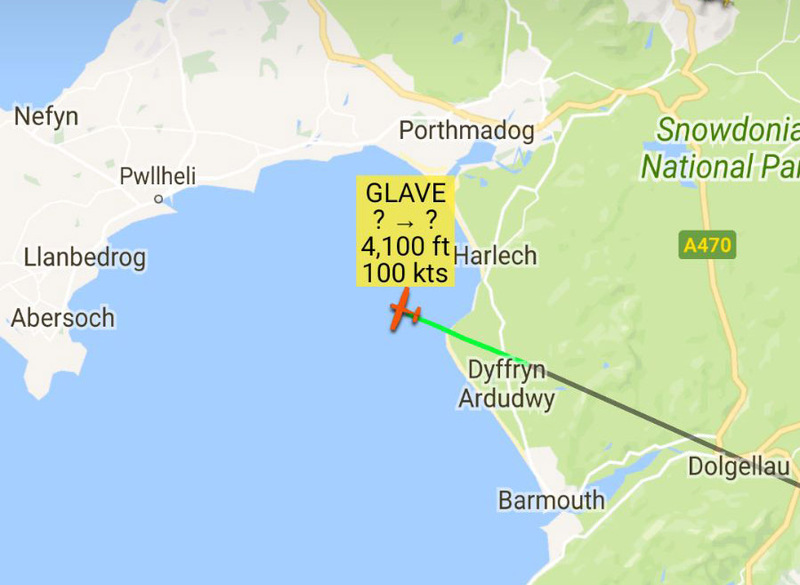 So, G-LAVE had arrived safely. It took a while for everyone to “have a gawk and a sit-in”. Our existing aircraft were nicely positioned alongside on the ramp to provide a unique and historic photo opportunity to get all 3 together. DDC has since been sold on and no doubt will re-emerge in a new guise before too long. G-LAVE- some detailed “gen” for those interested. 1999 Cessna 172 (R) model. 1100 engine hours up, state of the art Avionics, Fuel Injected, Auto Pilot – interiors and exterior paintwork in pristine condition. She is primarily intended for PPL fliers and is fully equipped for touring abroad. 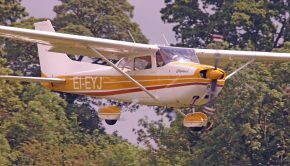 EI-EYJ will now become our Training aircraft although she too is equipped for Touring. 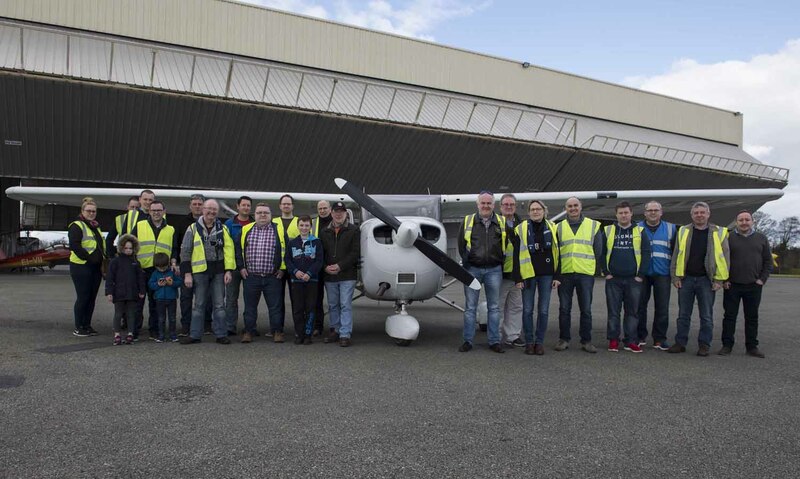 This will bring joy to the hearts of Some of our members seen beaming in the picture below. 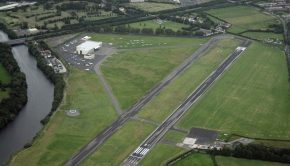 The purchase and delivery of G-LAVE now completes (amongst other projects) the 4 main objectives we set for ourselves at TFC in 2014. Fleet upgrades, Safety Equipment upgrades, Club profile enhancement, and increased membership. It seems we are “Mission Accomplished”. My deepest thanks to, and appreciation of, some truly dedicated and fantastic Committee members who embraced these objectives and brought them to fruition.